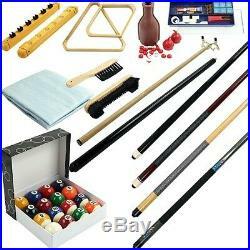 Billiards Accessories Pool Table Set Snooker Kit 32 Piece Cue Ball Indoor Game. Enjoy the excitement of a competitive billiards game without the pool halls or bars with this Billiards Accessories. This all-in-one set conveniently gives you everything you need to rack up the fun for this classic game, perfect for players of all ages and skill levels. Every piece in this attractive set is constructed with sturdy materials to provide hours of entertainment, without sacrificing quality for the ultimate addition to any game room! Look for our logo on the packaging for every one of our products. Billiards Accessories is committed to providing the consumer with the absolute best price and value on our entire line of products, which we ensure by applying a rigorous Quality Control process. HOURS OF FUN This complete pool table accessories kit provides everything you need for a variety of billiards games including 8-ball, nine-ball, Bottle Billiards, one-pocket and more! The fashionable pool sticks are crafted with quality care to provide amble balance and weight for the perfect shot every time. 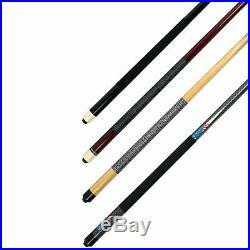 This set is fantastic for billiards players of all levels both kids and adults from beginner to proficient, or even for your own at home pool tournament. ALL INCLUDED This set also contains all the necessary accessories for table maintenance, including an under-rail brush, table brush, as well as a convenient universal cover to keep table felt clean. In addition, this set includes everything needs to enhance pool cue performance from chalk to a handy tip repair kit, complete with its own organizer and storage case! DURABLE MATERIALS This pool table set contains regulation size and weight balls at 2.25 in diameter, along with regulation size cue sticks at a stick weight of 21 ounces each. Both the cues and Roman Rack are made of durable wood material that has been polished for a unique and elegant finish, able to withstand everyday use! The Pro Series Royal Crown Billiard Ball set included are specially treated for fade resistance, chip resistance, and crack resistance. Product Details Set includes: 109 x 66 cover. 2.25 diameter Pro Series Royal Crown Billiard Balls set. 13 x 13 x 2.25 triangle rack. 8.25 x 12 x 2.25 diamond rack. 2-Piece Roman Rack 6-Cue Holder, each piece measuring 14 x 2. Plastic tally bottle with tally balls. Tip repair kit in plastic case 9.5 x 4 x 1. 2 chalk holders with red cord. 4- 57.5 cue sticks. 57.5 bridge stick and bridge head. Assembled Product Weight: 22 oz Assembled Product Dimensions (L x W x H): 34.00 x 16.50 x 5.50 Inches. Or converter to make it compatible with your nation's 220V-240V standard. Terms of sale and feedback. Feedback is extremely important to us. The item "Billiards Accessories Pool Table Set Snooker Kit 32 Piece Cue Ball Indoor Game" is in sale since Sunday, September 2, 2018. This item is in the category "Sporting Goods\Indoor Games\Billiards\Balls\Complete Ball Sets". The seller is "treehouse_deals" and is located in Smyrna, Georgia. This item can be shipped to United States, Canada, United Kingdom, Denmark, Romania, Slovakia, Bulgaria, Czech republic, Finland, Hungary, Latvia, Lithuania, Malta, Estonia, Australia, Greece, Portugal, Cyprus, Slovenia, Japan, China, Sweden, South Korea, Indonesia, Taiwan, South africa, Thailand, Belgium, France, Hong Kong, Ireland, Netherlands, Poland, Spain, Italy, Germany, Austria, Bahamas, Israel, Mexico, New Zealand, Philippines, Singapore, Switzerland, Norway, Saudi arabia, Ukraine, United arab emirates, Qatar, Kuwait, Bahrain, Croatia, Malaysia, Brazil, Chile, Colombia, Costa rica, Dominican republic, Panama, Trinidad and tobago, Guatemala, El salvador, Honduras, Jamaica, Belize, Barbados, Bermuda, Brunei darussalam, Iceland, Sri lanka, Peru, Pakistan, Paraguay, Viet nam, Uruguay.